Manila, Philippines - Thousands of workers led by the Alliance of Progressive Labor (APL) and its allied organizations converged in key cities on Labor Day to reiterate their demand for better wages, improved economy, jobs, security of tenure for workers and an end to demolition of squatter shanties. Edwin Bustillos, APL deputy secretary-general, said almost one year after the victory of President Aquino, workers have yet to see tangible gains. �Instead, what we have is a disastrous decision for the workers of PAL, violent demolitions of informal settlers and skyrocketing prices of oil, food and other prime commodities,� he said. Workers are being presented a Philippine Development Plan (PDP) for 2011- 2016 that merely provides a slightly updated version of the same old neo-liberal prescriptions, Bustillos said. The APL mobilized in Manila, Lipa, Cebu, Davao, General Santos, Cotabato and Cagayan de Oro. In Manila, the APL marched from Blumentritt Street and Espa�a Boulevard to link up with Kowalisyon Kontra Kontraktwalisasyon (KONTRA) and the Church-Labor Conference (CLC) in Chino Roces Bridge (Mendiola) across Malaca�ang. A Mass was held against contractualization celebrated by Auxiliary Bishop Broderick Pabillio. 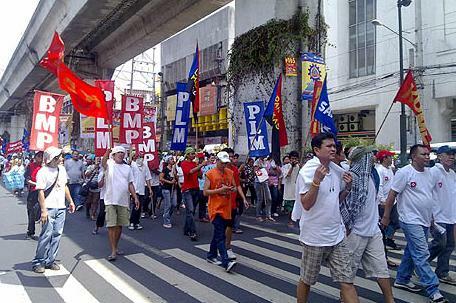 Joining APL in this year�s Labor Day march are the Philippine Metalworkers� Alliance (PMA), League of Independent Bank Organizations (LIBO), National Alliance of Broadcast Unions (NABU), Postal Employees� Union of the Philippine (PEUP), Confederation of Independent Unions in the Public Sector (CIU) and others. Josua Mata, APL secretary-general, said the PDP�s target of generating one million jobs per year is woefully inadequate. �We are alarmed that the PDP is still primarily hinged on exporting our way out of poverty even if the prospects for full recovery of our major trading partners are still uncertain,� he said. Mata said this same target inevitably found its way into DOLE�s Labor and Employment Plan for 2011 to 2016. �We certainly deserve a better deal,� Mata said. Thousands of workers, under the banner of APL and its allied organizations marched to Chino Roces to demand that President Aquino certify as urgent the Security of Tenure Bill and the immediate issuance of an executive order on moratorium on demolitions. The APL is also demanding for price controls as well as the suspension of EVAT on oil products. Together with KONTRA, APL call on Aquino to reconsider his decision on the outsourcing of the Philippine Airlines (PAL) as this would open the floodgates for abuse. Workers and activists Sunday marched on the streets of major cities across the country to demand higher wages amid rising prices and to protest contractualization, while the government held jobs fairs in every region. �He did not address our demands for wage increase. He did not address the protection of job security through opposing contractualization. He did not address our appeal for the reduction of oil prices,� Partido ng Manggagawa (Workers Party - PM) national chair Renato Magtubo said at Chino Roces (formerly Mendiola) Bridge. PM has been fighting alongside the Philippine Airlines Employees� Association (PALEA) in overturning the termination of some 3,000 contractual employees. PM members and allies led a march on and attended Mass at the Chino Roces Bridge from morning until noon. ZAMBOANGA CITY, Philippines � Public transport organizations and militant groups in Mindanao held simultaneous rallies on Sunday and protested the high cost of petroleum products and demanded the Aquino government to repeal the Oil Deregulation Law and scrap taxes on oil. 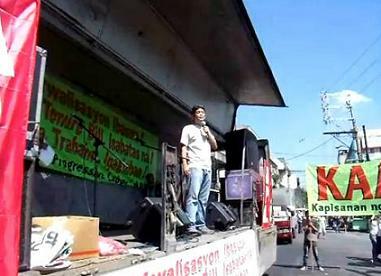 The rallies coincided with the International Labor Day and in Zamboanga City, public transport federations allied with Akbayan party list, held a protest caravan and picketed several gas stations. 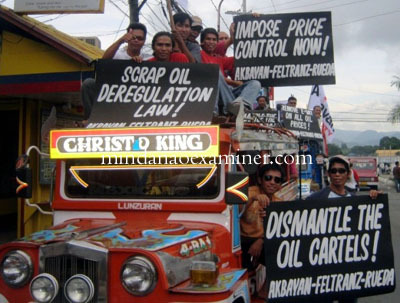 The Federation of Land Transportation Associations in Zamboanga and the group called Responsible Union of Empowered Drivers Associations protested against recent oil price hikes and branded the new increase in petrol products as �unjust� and reiterated their call to dismantle the oil cartel and to scrap the Oil Deregulation Law. 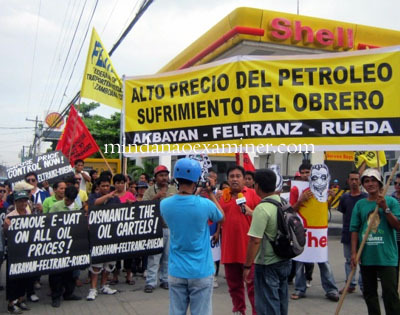 �The on-going chaos in the Middle East caused movement of oil prices worldwide, but the supply and price manipulation of the greedy oil cartel, led by Shell, Caltex and Petron, made the suffering of the people worst,� Kabayan said in a statement. Akbayan party list Representative Walden Bello said that President Benigno Aquino III should impose price control rather than giving more subsidies to address the spiraling cost of oil and basic commodities. �I would prefer price control, with the government fixing a price that would enable companies to make a profit but not super profits as they are reaping right now. The price should be reviewed monthly and adjusted depending on international price trends,� Bello said. Eduardo Mingala, FELTRANZ President and Akbayan Zamboanga City Division Vice President, said the local public transport drivers and operators are also faced with price manipulation of local oil businessmen that peg the price of diesel and gasoline higher than other cities in Western Mindanao. �This should be investigated by the Zamboanga City Council and sanctions must be imposed to these unscrupulous businessmen that only care about accumulating huge profits at the expense of the poor drivers.� Mingala said. On the other hand, Hermogenes Awid, RUEDA President, also called on the President to scrap the Oil Deregulation Law because it only added to the burden not only of the public transport groups, but the public in general. �We are calling on President Aquino to scrap Republic Act 8479 or the Oil Deregulation Law that empowered the oil cartel to impose unjust oil price hikes without Government Control,� Awid said. May Day report: Aquino is failing on his �pet programs� vs poverty, corruption, etc. REMEMBER the famous and catchy �Kung walang korap, walang mahirap� (rough translation: �If there is no corrupt, there will be no poor people�) slogan of then candidate Noynoy Aquino during the campaign for the presidential election last year? Although it is na�ve or simplistic to claim that poverty will disappear if corruption will be eradicated, that electoral jingle was nonetheless very effective not only due to its plain message but also to the pledge that it implies � that the administration of Benigno Simeon C. Aquino III will simultaneously fight the rampant and worsening poverty and corruption. But even this early or two full months before his first year in office, the Alliance of Progressive Labor said that this is already enough to gauge the direction or tendencies of the Aquino government: that it has miserably failed to keep its avowed promises. Corruption has deteriorated with the country landing again in third spot in the entire Asia by scoring 8.9 � with 10 being the worst, from a scale of one to 10 � based from a survey called Asian Intelligence Report held from November last year to February this year. Beating the Philippines � with a slightly �better� previous score of 8.25 � were Cambodia (9.27) and Indonesia (9.25). It was conducted among top expatriate business executives in Asia by the Hong Kong-based Political & Economic Risk Consultancy Ltd. (PERC). It is almost the same in the global level as shown in the annual report of Transparency International (TI), with the Philippines notching a 2.4 score � with 1 as �highly corrupt� and 10 �very clean,� as opposed to PERC scale � for two straight years now, and placing 139th among 180 countries in 2009 and 134th among 178 countries last year. Likewise, both the perceived and actual poverty has continued unabated to this very day � despite the boasts of Gloria Macapagal-Arroyo of accomplishing �36 quarters (or nine years, January 2001-June 2010) of uninterrupted economic growth� and Aquino�s attaining the �highest economic growth in 34 years� or from 1.1 percent GDP (gross domestic product) in 2009 to 7.3 percent in 2010, mostly in the last half of the year or under the helm of P-Noy. Even the 1st Quarter 2011 Survey of the Social Weather Stations (SWS) held on March 4 to 7 has confirmed the escalating economic hardship of the majority when it indicated that more than one in five Filipino families or 20.5 percent of the respondents have undergone �involuntary hunger� at least once in the past three months. It is equivalent to an estimated 4.1 million families or about 20.5 million individuals (based on the average five-member Filipino family), and an increase from 18.1 percent or 3.4 million families or around 17 million people recorded in a similar survey last November 2010. While 51 percent of the respondents in the said survey considered themselves as �poor,� representing 10.4 million families or approximately 52 million people � a hike from the 49 percent result in November. In addition, the said SWS survey bared that 40 percent of the respondents or 8.1 million families or about 40 million people believed themselves as �food-poor,� up from 36 percent last November. At any rate, even the conservative government statistics acknowledged that the number of poor Filipinos � in spite of the said bragging of both Arroyo and Aquino � has swelled from 25.5 million people in 2001 to over 30 million last year. There are other studies that yet put the number of impoverished Filipinos to as much as 2/3 or at least 70 percent of the Philippine population, which already reached to 94 million in 2010. �Jobless growth� is one of the terms that economists describe this type of economic �development,� which is characterized by its failure to equitably redistribute income or at least � to use a classic capitalist clich� � to �trickle-down� the wealth to the majority of the citizens. And as the term denotes, in a jobless growth there is a proliferation of generally poor quality jobs or a rapid surge in the ranks of contractual or non-regular workers, which is in fact happening today, the APL said. Significantly, contractuals and the like � casuals, probationaries, apprentices, seasonals, OJT (on-the-job) trainees, practicumers, pakyawan, etc. � are usually low-paid, lack many benefits, have no security of tenure, and banned from joining trade unions and thus are not covered by CBAs or CNAs. They encompass even the so-called �highly-paid� (but with unstable wages and benefits) staff in the burgeoning business process outsourcing (BPO) industry, especially the call center agents, precisely because most of them are hired as contractual employees or based on a specific project only. Related from this are the still distinct two groups of workers, the self-employed and unpaid family workers � designated by the International Labor Organization (ILO) as belonging to �vulnerable employment sector� � that are quickly rising in number. Even the data from the Department of Labor and Employment (DOLE) conceded that �vulnerable workers� have steadily grown from 13.5 million in 2004 to 14.9 million in 2009 or a staggering 42.6 percent of the 35 million �employed� in that year. It further expanded to more than 15 million of the 36 million �employed� or nearly half of the 39 million labor force last year. There is still a separate and even more pathetic and exploited class of workers called by the ILO as �working poor people� � those who earn less than $2 or below P100 a day � and in the Philippines has multiplied from 7.9 million in 2003 to at least 9 million in 2009 or a shocking 30 percent of the total �employed� in that year. As if these are not enough, the costs of basic commodities and services have recently and uncontrollably skyrocketed. For instance, prices of petroleum products, particularly gasoline and diesel, have increased more than 12 times from January to April causing a domino effect in actual or planned hikes in LPG rates, transport fares, electricity and water bills, toll gate fees, prices of various food items, and many others, which will obviously affect more the majority poor than the few rich. The problem is, aside from the real oil price hikes in the world market � triggered by the catastrophes in Japan and the continuing social upheavals in the Middle East and in North Africa, specifically in Libya � the undue surge of prices of local petroleum products is caused more by �predatory pricing� led by the �Big 3� oil cartel of Petron Corp., Pilipinas Shell Petroleum Corp. and Chevron Philippines Inc. (formerly Caltex). Even the Department of Energy (DOE) has grudgingly admitted that at least the fuel price hikes during the Holy Week � first exposed by journalist Jessica Soho and later satirized as �Oily Week� by the Philippine Daily Inquirer � �were more than what was warranted� (read: not justified). This relentless price hikes coupled with greedy profiteering have further diminished the purchasing power or the real amount of the already low salaries of most of the Philippine workers. For example, according to a study by a reputable research institution, the current P404 minimum � and nominal � wage of workers in Metro Manila is actually equivalent to P253.43 only today by using 2000 as the standard base year and considering changes in inflation. Furthermore, the same study demonstrated that in so short a time since Aquino was inaugurated as president on June 30 and until as recently as February this year � the real value of the Filipino workers� already meager wage has been sliced by as much as P7! In a nutshell, the APL asserted that the Filipino and Filipina workers have not enjoyed any significant gain since P-Noy assumed the presidency. His continued although still discreet promotion of unfettered neoliberal programs � liberalization, deregulation and privatization � will exacerbate poverty and misery of the vast majority in the Philippines, especially the working people. The Partido ng Manggagawa (Worker's Party - PM) called on the Metro Manila regional wage board to grant the P75 wage hike petition as it convened for its first public hearing today. �We ask the wage board to break expectations and approve the P75 petition since our study reveals that the cost of living for a family of six in Metro Manila as of March this year is already P1,010 a day,� asserted Renato Magtubo, PM national chair. Magtubo meanwhile criticized President Benigno Aquino III for Labor Day announcement yesterday. �Private sector workers got nada from PNoy. PNoy did not really break bread with labor but he broke tradition by giving nothing to workers, not even a consuelo de bobo of non-wage benefits,� he stated. �Even if NCR (National Capital Region) wage board approves the P75 petition, it will not be enough to bridge the huge gap between the minimum wage and the cost of living. The disparity between the P404 minimum wage and the cost of living is P606 or 150% of the ordinary wage. Even if two members work�which is the buy one, take one policy of the government�then their combined income will not be enough to feed the entire family,� stated Magtubo. PM arrived at its cost of living figure using its April 2010 survey of the daily cost of living and the National Statistics Office�s 2.6% estimate of the inflation rate from April 2010 to March 2011. �Our estimate is already an understatement since the rise in prices has been accelerating since March,� Magtubo clarified. Beyond the immediate wage hike issue, the group is however pushing for an overhaul of the wage fixing system in the country. PM is advocating for the establishment of a National Wage Commission to replace the regional wage boards. �The National Wage Commission will be different from the wage boards in that its mandate is to fix wages based on the single criterion of cost of living. And despite the huge difference between the minimum wage and the cost of living, the National Wage Commission can bridge the gap by a host of mechanisms among which are direct wage increases, tax exemptions, price discounts and social security subsidies for workers,� Magtubo explained. May Day Statement: Enough to Poverty! Enough of Government Inaction! Intensify the Struggle Against Capitalism! Enough of Poverty! Enough of Government Neglect! Intensify the Struggle Against Capitalism and towards Socialism of the 21st Century! This May 1, despite getting rid of the hated government of Gloria Macapagal Arroyo and electing a new President Noynoy Aquino who has promised to end corruption and poverty, over 100 years since the first May Day, Filipino workers and the poor have very little to celebrate. Despite the high expectations of large sections of the working class and the poor who voted for President Aquino, his government has failed to address any of the substantial questions facing Filipinos today: poverty and hunger, low wages, unemployment. The latest SWS survey showing an increase in hunger is a major concern that must be taken seriously and not brushed off in a squabble over statistics. According to the March 4-7 poll 20.5% of respondents -- or an estimated 4.1 million families -- have gone hungry at least once in the past three months. This is up from the estimated 3.4 million families recorded in November 2010, i.e., almost one million extra families are going hungry today due to poverty. Along with the other examples of poverty and marginalization � such as the shocking deaths of up to 30 people in Palawan, including children, due to easily preventable ailments such as diarrhea � this demonstrates that the situation of the masa is deteriorating. The fact is that wide-spread poverty, and related hunger, continues to exist and is the most serious socio-economic problem that the country faces today. We don�t need statistics to tell us this. The masa know this and we experience it in our daily lives. The deteriorating situation of the masa and the seeming inability of the government to reverse the trend represent the failure of the government to carry out its promise of poverty reduction during its first year in office. We needed far reaching reforms and strategies � at least 12 months ago. Without meaningful measures and reforms the situation for the masa will continue to worsen, and poverty and hunger will increase. The President must put forward a concrete development plan. The President must have a clear strategy for poverty reduction and must have the political will to implement them. At the heart of such a strategy and plan should be far-reaching measures for job creation for the country�s citizens � not Conditional Cash Transfer programs. There is no time to waste. The people are hungry and are getting desperate. Scrap the Value Added Tax! Extend the Moratorium on Demolition! For a P125 daily minimum wage increase! Job creation program for the youth! In intensifying our struggle around these demands, we reaffirm our commitment to the unity of the left and progressive movements who also support these demands and we will explore all avenues to maximize the unity of the mass movements to strengthen our struggles to protect and defend the masa. This May 1 PLM also reaffirms its commitment to international solidarity. We will draw on the lessons and the inspiration provided by workers and comrades struggling around the world, to challenge the capitalist order and build socialist alternatives -- from peoples power in the Middle East, to the mobilization of workers and students against cutbacks in Europe, to the comrades in Latin America who are showing us the way towards the Socialism of the 21st Century. We also extend our warm solidarity to our sister socialist parties in the Asia region and we will continue to support all initiatives to strengthen our networks and relations. A SPECTER is haunting the worker�s movement as it celebrates Labor Day today�the specter of �end of contract� (endo) and low minimum wages. Endo (not his real name) works as a computer-aided machine operator in a big auto plant at the Laguna Technopark. He is 23 years old, single, a college graduate and a native of Bi�an, Laguna. Living with his parents and two brothers, Endo is the family�s lone bread winner. He works six days a week, from Monday to Saturday, for a minimum pay of P337 a day or P8,762 a month. He works as a contractual worker and his five-month contract will end next month. End of contract or endo is the latest buzzword or name for workers who stay on a job not longer than five months before he or she is fired and hired again for another five months and so on. Endos are paid the prevailing minimum wages�the farther they are from Manila, the lower the pay. Anne (not her real name) works at a company that produces glass disks. A high school graduate from Samar, she is the typical barrio lass who comes to Manila looking for the proverbial greener pasture. She is 26 years old, single and now lives in Laguna close to the factory where she works. She sends money to her family in the province to help her parents put her two siblings to school. Anne, like Endo, is also a contractual worker. She works on a 12-hour shift, earning P490 a day. If she works for only eight hours, she gets the minimum rate of P337, minus the usual deductions for contributions to the Social Security System, Philhealth and the Pag-Ibig Fund. She spends P257 a day for food, jeepney fares, tricycle rides and for board and lodging. That leaves her less than a P100 when working eight hours a day. That drives her to work four more hours to earn an additional P150 for overtime work, allowing her to buy a new set of clothes every year, the only luxury she can afford. Last year, a local union of the International Textile, Garments and Leather Workers Federation conducted a survey of incomes and expenditures of workers in big and medium-size garment factories in an export processing zone in Cavite. Results of the study showed an even harder and pitiful life for our minimum wage workers. In field interviews, sewers and cutters were asked how much they were paid in an ordinary workweek and where they spent their money. The minimum wage in the area at the time of the survey was P298 a day for an eight-hour work. A majority of the informants were women, single and the only wage earner in the family. Extrapolating from the data, the study found that the average weekly spending for food and nonfood items was P1,668 or a total family expenditure of P6,672 a month. The total wage income for a six-day workweek was P1,788 or a monthly income of P7,152. This leaves an extra cash of P480 a month or P16 a day, barely enough for rent, electric and water bills or a cup of coffee. Hardly anything is left for medicines, shopping or savings. The stark reality is clear: the minimum wage is barely enough to feed a family of five. In order to survive, a factory worker, whether single or married, must earn twice the prevailing minimum wage to be able to buy food and provide for other equally important family needs. Stated differently, at the current minimum wage there must be at least two breadwinners for a family of five or six to keep body and soul intact. Endo works for a big auto car parts manufacturer. Anne works in a big glass factory under the auspices of a manpower agency. Our female sewers work for a number of small and big companies in the processing zone. They all work under different employers in different industries and workplaces. They all have one thing in common: they are all contractual workers paid below the minimum wage. The typical minimum wage worker is young, female, educated and single. She comes from the province, is a lone income earner in a family of five or six and is a contractual. In other words, she belongs to the working poor. Our minimum wages today are only a little above the poverty threshold. This is true for workers in the export processing zones as it is for the rest of the country. If minimum wage earners find it hard to cope with the demands of daily living, how difficult is it for those whose incomes are below the minimum wage? Poverty statistics are generated by the government every three years. The last poverty estimate was recorded for 2009. Estimates are made for families or individuals. The standard measurement assumes a family of five. Anyone whose income falls below the poverty threshold is considered poor. In 2009, the poverty threshold for a family of five was estimated at P7,936. If Endo or Anne works only from Monday to Friday he or she gets a gross pay of P7,414. Clearly, below the poverty threshold. There are 5.6 million workers who are directly covered by the minimum wage law. They are wage and salary earners who work for an employer or particular company, according to the National Wages and Productivity Commission. If minimum wage workers earn below or a little above the poverty threshold then we can conclude that many of them are poor. There is another disturbing fact. A big number of the labor force is not covered by the minimum wage law. These are the unpaid family workers and the self-employed who comprise 64 percent of the entire labor force of 37.9 million in 2009. Largely outside the protection of labor laws, they work in precarious conditions and are vulnerable to all kinds of abuse, including nonpayment of minimum wage. This limited coverage and inordinately low wage levels have made the minimum wage law a favorite target of criticism by workers, employers and some people in government. Workers complain that it is a poverty wage. The employers say the minimum wage is high that they can no longer afford it. The government has taken notice of its unintended consequences. It is now prepared to introduce a more flexible system. The problems associated with a minimum-wage regime are enormous. The issue of poor coverage is only one. Another is the issue on exemptions. There are companies that avail themselves of the exemption clause every time a new wage order is issued. The exemption can vary from individual company applicants to a whole cluster of industry groups like exporters and those whose assets are less than P3 million. An equitable minimum wage system is one that can apply to as many workers as possible. Minimum wage systems are tools to distribute wealth and thus help reduce poverty. Republic Act No. 6727, the law that created the regional-wage fixing mechanism, instead of one national minimum wage, is a failure. It has failed to live up to its mandate of rationalizing wage setting in the country. Instead, it created layers of minimum-wage rates at the regional level with one region having as many as 40 wage scales in as many cities or municipalities. There was a time when there were about a thousand wage rates all over the country. Today, the number has been reduced to about 200. A largely differentiated wage scale even in one region creates problems of implementation. Not only workers but also employers are at a loss on what rate to enforce in an area close enough to each other. Somehow, it creates problems of equity. Cainta, for instance, which borders Pasig City and Quezon City, is part of Region IV-A whose minimum wage is P337. But Quezon City and Pasig City are part of Metro Manila whose minimum wage rate is P404. A factory on one side of the street in Cainta would invariably pay less to its workers compared with the one on the other side which happens to be in Metro Manila. This is replicated in the provinces of Batangas, Cavite and Laguna where contiguous towns and cities would have different wage rates. The minimum wage in San Pedro, Laguna, is P337 but a few kilometers away, across from the South Luzon Expressway, is Cabuyao, Laguna, where the minimum wage is P315. Even the concept of what a minimum wage is underwent drastic change. Previously, the minimum wage was considered the lowest remuneration an employer can pay a worker. This is the concept of the floor wage. Today, the minimum wage has become the prevailing wage. What used to be a floor wage is now considered the highest salary bracket. The Coalition for Labor Agenda calls for a complete reevaluation of the minimum-wage setting process in the country. There is a need for an alternative-wage setting mechanism. The ideal situation is a national minimum wage with no exemptions. On top of the minimum wage is a tier determined through collective bargaining at the industry, territorial and the firm level. This will require strengthening of workers� bargaining power by removing constraints for union organizing. But the bigger question is, why are so many workers trapped toiling with minimum wages? That�s because of massive unemployment and underemployment. For as long as the economy is unable to create decent and productive work for all, large numbers of workers will be consigned to low pay, substandard working conditions, employment without job security, etc. In other words, grinding poverty. Jobs cannot be created without industries, a vibrant agriculture and a fully developed fisheries and maritime industry. The economy�s inability to develop is due to the lack of a cohesive industrial development plan. And yet, all administrations since the fall of the Marcos dictatorship took a headlong dash toward trade liberalization that left our agriculture and industry in tatters. Growth alone does not guarantee employment creation. Despite modest economic growth the past few years, unemployment and underemployment continued to increase. This is called the phenomenon of jobless growth. There is no other choice. The lack of employment opportunities in the country pushes our workers to go abroad, which leads to brain drain. This Labor Day, the Coalition for Labor Agenda challenges the Aquino administration to make use of its popular mandate; walk the talk on matuwid na landas (straight path) and give the millions of Filipino workers a new and better deal, especially the working poor. Workers need a wage adjustment but the more important thing for them and the country is to be freed from poverty and underdevelopment. End poverty wages and ensure job security. Today, the Filipino working class celebrates the international workers� day against a backdrop of growing inequalities and economic turmoil. This economic lack of correspondence between �economic growth� statistics and poverty incidence have persisted as economic development failed to lead to the optimal employment of human resources, reduction of inequity, and the substantial improvement of the opportunities and lives of the poor. We in Akbayan assert that it is of grave importance to any development program and all poverty alleviation efforts to make employment opportunities available to the poor and unemployed and ensure that wages and non-wage benefits are adequately provided and in compliance with the labor law. As the cost of living continues to rise, minimum wage becomes increasingly inadequate for workers and their families. And because the pool of unemployed is so vast and jobs are scarce, the Filipino masses would take on any available job, forgoing the risks and the making do with the bare-minimum benefits whatever sort of employment affords. This has granted, for the longest time, the private sector the upper hand in labor-management relations. As such, we support the workers� call for a substantial increase to their wages by bringing it closer to the �living wage,� or the level that would allow workers to adequately meet the costs of living. This is a matter of both economic urgency and social justice. The Aquino government in cooperation with different labor organizations and other stakeholders must seriously consider a wage increase. In the meantime, that wage increase remains unresolved, a good measure that the government can undertake is to provide, and encourage the private sector to provide, increased non-wage benefits such as tax exemptions, emergency allowance and other social security subsidies that would improve the capacity of workers and their families to weather economic difficulties. Second, it would also be important to heed the discontentment of labor organizations regarding the powers of regional wage boards and consider their abolition. In essence, regional wage boards have been used as a means to consolidate the power of employers against labor, which has rendered its existence antithetic to its main purpose � to empower workers especially when it comes to the determination of wages. In terms of creating jobs, we urge the administration to implement the labor-based/ equipment supported (LBES) technology when undertaking infrastructure and public works construction and maintenance. Endorsed by the International Labor Organization (ILO), this means optimizing the number of laborers to construct and maintain public infrastructure, instead of the commonly preferred alternative, which is to intensify capital or equipment. Using LBES, employment in construction projects would increase by 10- 30 per cent, it is particularly ideal for boosting employment and social welfare in developing countries that have high unemployment rates and scores of development projects in the pipeline. As the Aquino administration sets out to implement major infrastructure projects, it is in the best position to maximize the Philippine labor force and improve over-all welfare of the people by employing the LBES technology. The jobs created will translate into a constant income stream for families that have had to weather the one-two punch of poverty and underdevelopment and put them on the path to improving their lives. It will pave the way for self-sustainability and reduce the poor�s dependency on conditional cash transfer programs, finally breaking the vicious cycle of poverty. By encouraging the implementation of LB technology in infrastructure development, we are also able to ensure that the contribution of the private sector to the economy is not solely for the improvement of growth rates and other statistical economic indicators but also trickles down to grassroots communities and improves the standard of living for a majority of the population. We also propose that the Aquino administration look into the private sector�s sub-contracting practice. Sub-contracting is the new trend in employment, the private sector minimizes costs and obligations to their employees by keeping them on short-term contracts. However, especially at a time of economic crisis, the periodic termination of employment leaves workers and their families with very little to prevent their descent into poverty. By periodically replacing employed people by unemployed ones, this employment illusion will certainly provide no improvement to the nation�s 7.4 per cent unemployment rate, nor will it have considerable contribution in the administration�s anti-poverty efforts. It is important to ensure that employers will not make radical cuts in employment to maintain profit margins, and ensure that workers are provided with permanent employment and the corresponding benefits, as stipulated in the labor code. The Aquino administration must remain on the side of workers and regulate, and even minimize, the private sector�s sub-contracting practices. We encourage the government to support our on-going legislative effort to redesign the rules governing contractual work and ensure the security of tenure of workers, to ensure the jobs for the Filipino people. We also call on the administration to certify the Security of Tenure bill pending in Congress as urgent. By addressing the question of stable jobs and higher wages, it would create a wider base of working people that would serve as the fuel to the economy. As the workers� purchasing power improves and they are able to meet the needs of their families, the better off they become, and the better they perform in their jobs.